A characteristic element in Norbert Brunner-Lienz’ work is his confrontation with language. In his audio installations and experimental radio plays, but also in his drawings and literary-artistic texts, he deconstructs and transforms psychological, iconographic, mythological and fantastic elements and meanings. 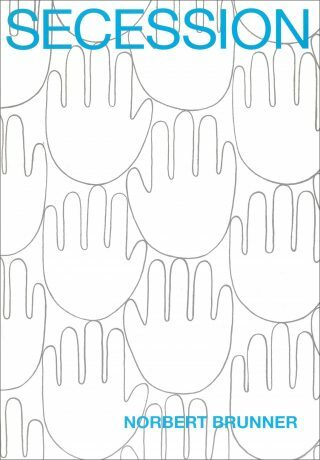 This results in complex analytical and simultaneously aesthetic-poetic language images, which reveal new fields of relationships between icon, index and symbol and grasp text as a material and medium that is malleable and performable in fine art. In the Secession Norbert Brunner-Lienz shows the project Im Spiegel der Psyche (“In the Mirror of the Psyche”), which conjoins a cycle of drawings and an experimental radio play. The text of the radio play forms the basis for the narratives in the drawings. The focal point of the work is the psyche in an ambiguous sense. In addition to the meaning of the word for mental processes and intellectual functions, in Austria the word “Psyche” also refers to a dressing table with a mirror. 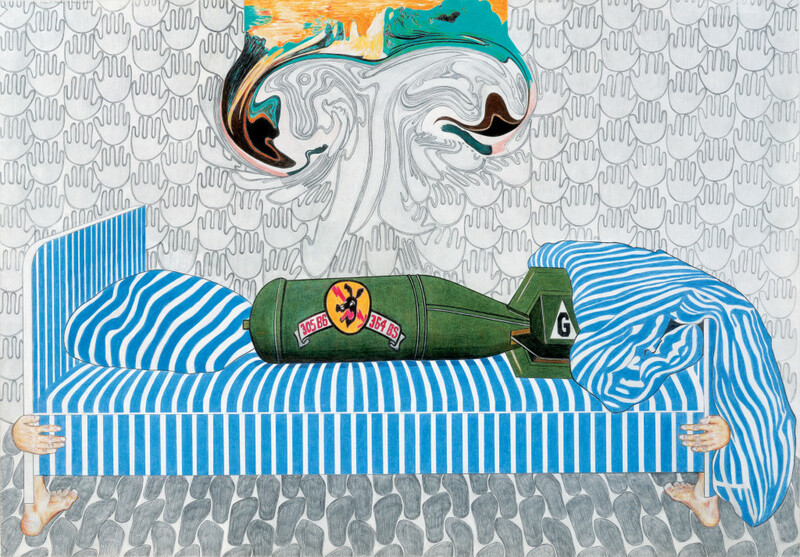 What is shown in the mirror of the “Psyche” in Brunner-Lienz’ pictures is a bedroom with the furniture found in it, where the oppressive atmosphere evokes three central themes—fear, loneliness, and sexuality. An aura of the uncanny derives from the depiction of the furniture as protagonists of a sleepless situation fantastically awakened to life and paradoxically equipped, but also from the stories that are inscribed in the pieces of furniture or told by them. Each of the pieces of furniture tells its own story—a shape of nocturnal waking with its absurd implications—charged with iconographic elements, banal word plays, or mythological references. The hinges, corners and feet of the furniture are depicted as human extremities. The walls and furniture have hands and feet, the metronome an ear. All these details fulfill functions in the context that is addressed. 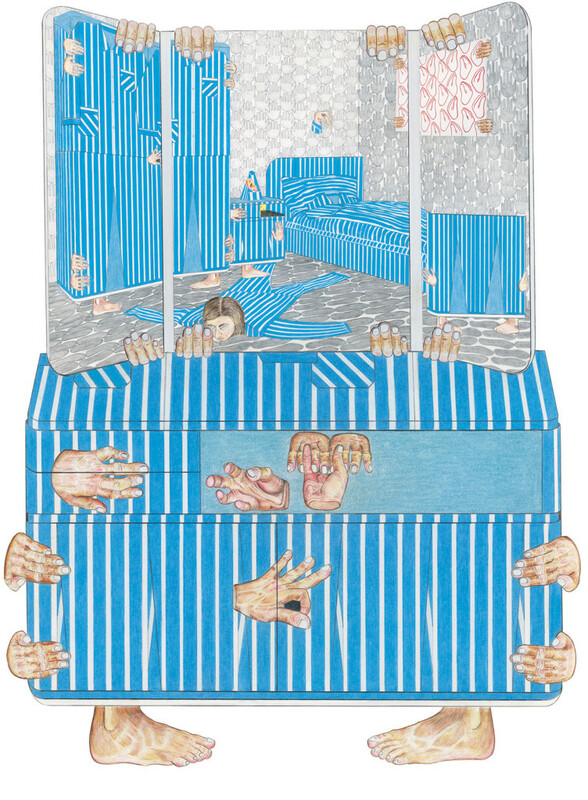 The uniform blue and white striped depiction of the furniture reminds us that the room is actually dedicated to sleeping, but does not permit it; instead, the impressions and fears repressed in sleeplessness appear and arbitrarily recompose themselves. 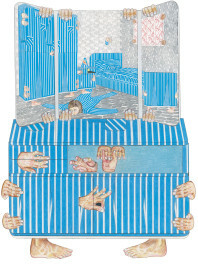 The blue and white strips are also reminiscent of pajamas worn by the artist, who has put himself into one of the drawings as a bedside rug. As a depiction of what is incomprehensible in the subconscious, the subject merges with the objects. 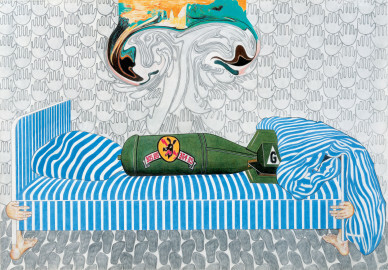 There is a bomb lying in bed, above it hangs a picture of the mountain range Rose Garden, in the Germanic saga of the kingdom of the dwarf king Laurin, exploding. A rubber tree peeps out of a cupboard, evoking the cliché of a deserted island. The artist himself is seen on the high seas wearing the foot of the bed on his head, whereby this subject alludes to themes from the Old Testament and its representations in the Romantic era. The two stories of origins from Christian religion, that of the crucifixion of Jesus and that of Adam and Eve, were often linked together, for instance with Jesus standing on the head of Adam. The nightstand, furnished with a fleece and a valley, the child-like portrayal of the Emmen Valley, refers to the Greek saga of Jason and the Argonauts, but is naturally also a symbol of sexuality. Open, it shows the scene of a small boy blowing a trumpet, which was inspired by both a picture by Kippenberger and the book Gargantua and Pantagruel by Rabelais, and which also alludes to the first cry after birth with its literal “onomatopoeia”. The lamp is a reference to Leonardo da Vinci’s Madonna pictures and Sigmund Freud’s Leonardo da Vinci and a Memory of His Childhood, which is usually regarded as an exemplary case of a psychoanalytical interpretation of art works. 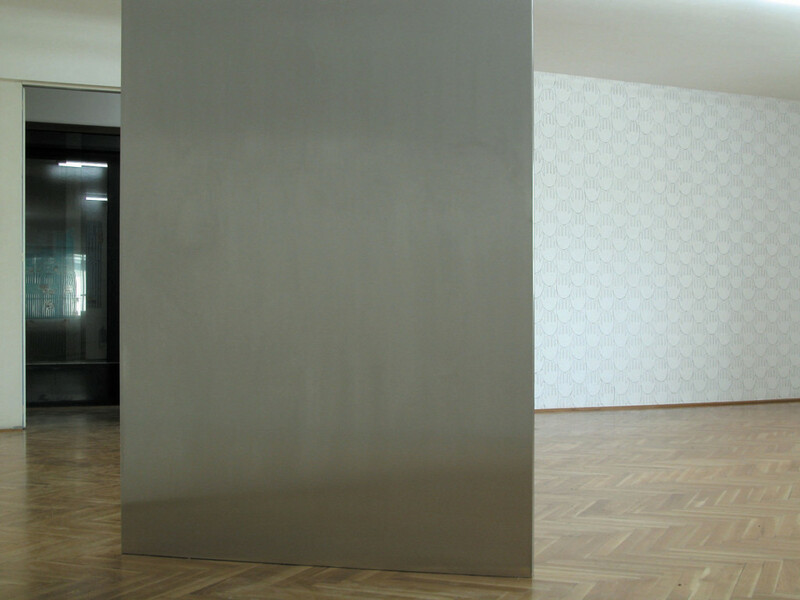 In the Grafisches Kabinett, the hanging of the drawings and the positioning of the mirror as the central moment in the space take up the absurdity of the entire scene once again. In the staircase to the Grafisches Kabinett, the text based on the picture series can be heard as a sound installation. In cooperation with Kunstradio from the Austrian Broadcasting Corporation, Norbert Brunner-Lienz has composed a radio play for four voices (the number refers to the number of pieces of furniture in the imaginary room) from the text, which will be broadcast in Kunstradio (July 6, 2003, 11 a.m.-12 noon, Im Spiegel der Psyche, Kunstradio Ö1 and Online Artradio). Norbert Brunner-Lienz, born in 1959, lives and works in Innsbruck and Vienna.